Summer-lazy, hazy, days. 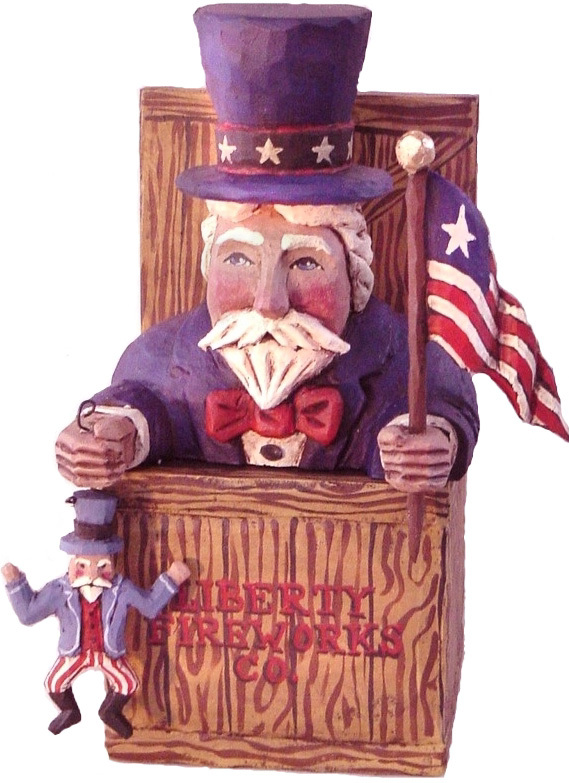 Our wonderful patriotic items feature hand carved Uncle Sams, and other folk art designs. We will be bringing more items for those summer gift needs, so stop back soon! Every so often something comes along that is truly spectacular. This George Washington mounted on his horse is such a piece- truly spectacular! This masterpiece is by Ed Prybil, a master in folk art carving. Uncle Sam carvings by various American folk artists. The following patriotic figures are all nutcrackers. The first 3 are hand carved Uncle Sams. Click on the photo to see a larger version of these wonderful patriotic fellows. Renowned folk artist, Mary Myers' patriotic figures. Polonaise patriotic ornaments. The brass stands they hang from can be ordered for $3, with a purchase.